According to Dr. Colleen Kraft, President of the American Academy of Pediatrics, the U.S. President of the United States, Donald Trump, is deploying a policy of separating immigrant children from their parents at the U.S. southern border that is tantamount to child abuse. 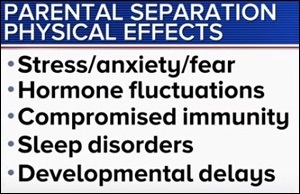 Speaking on CBS News (see video below), Dr. Kraft said when she visited a detention facility for separated children in Texas she saw a toddler girl “sobbing, wailing and beating her little fists on the mat.” She said staff there are told they are not allowed to hold a child to comfort them when they are crying. Millions of adult Americans know firsthand the emotional trauma that is caused to a child from a sudden separation from a nurturing parent. I am one of them. When I was a very young girl my mother slipped in the bathtub and broke a rib. We had friendly, trustworthy neighbors who had a son my age. They offered to take me in until my mother was well enough to be released from the hospital. Although they went out of their way to be kind, the lasting image I have of that time was sitting by myself in a corner of their living room feeling abject terror at the thought I might never see my mother again. I believe it was this incident that created my developmental lag which manifested itself in serious reading problems into the third grade. By the fourth grade, we were living with my grandmother, in her home located next door to my first cousins, in a loving, nurturing environment. I became a top student from that time on and went on to graduate high school as Valedictorian. My trauma occurred despite being in the loving home of a neighbor. There were no security guards, no metal cages surrounding me. There was no threat that my mother might be deported and I might never see her again — the fears that these immigrant children are facing on top of separation anxiety. Dr. Lisa Fortuna is the Director of Child and Adolescent Psychiatry at Boston Medical Center. She has 20 years of experience as a psychiatrist and has worked extensively with vulnerable children and families. In February of this year, Dr. Fortuna submitted an amicus brief in support of a lawsuit filed by the American Civil Liberties Union (ACLU). The ACLU was challenging the separation of a 7-year old girl from her 39-year old mother under the new Trump policy. The two had traveled from the Democratic Republic of Congo and surrendered to immigration officials in December, asking for asylum. They told the officials they were fleeing violence in their country. “Factors such as the level of supervision, familial and social support make a difference in the level of distress children experience. Hodes et al., (2008) discovered that PTSD [Post Traumatic Stress Disorder] and depressive disorders were significantly higher in children with low-support living arrangements as compared to those with good social supports and attachments. On top of this expert testimony, consider the report from ProPublica yesterday that included a tape recording of traumatized and distraught sobbing toddlers and young children who were separated recently from their parents by immigration officials at the U.S. southern border and being held in a detention center without any communication with their parents. A 6-year old girl can be heard begging for someone to call her aunt to come and pick her up. She says she has memorized her aunt’s phone number and proceeds to recite it in a desperate plea for someone to help her. Someone did. A civil rights lawyer who was allowed inside the facility made the tape recording and turned it over to reporter Ginger Thompson at ProPublica. Thompson appeared on the popular Rachel Maddow show on MSNBC last evening. The tape was played, bringing awareness to millions more Americans of the crimes against humanity that President Donald Trump is carrying out in our name. Attempting to rally his base, Trump appeared at an immigration policy event in Bethpage, Long Island, New York on May 23. Speaking about immigrant children, Trump said: “They look so innocent. They’re not innocent.” How could any civilized human being say that a child is not innocent? For that matter, how could any civilized human being say many of the things that Trump has been caught saying on tape — like his being allowed to grab women by the p*ssy because he is a celebrity. With policies that distinguished experts now call child abuse, Trump has lost all pretense of moral authority or fitness to serve as Commander in Chief. It’s long past the time for the leaders in his own party to march to the White House and demand his resignation before he spreads further his cruelty and unhinged pursuits. Every American who fails to speak out at this dangerous time for our country is guilty of being an accomplice to Trump’s brand of inhumanity.